1 Javier: ¿Vas a correr conmigo, o no? Ana: Sí, voy a correr contigo. Ir + a + infinitive Javier: ¿Vas a correr conmigo, o no? Ana: Sí, voy a correr contigo. 3 I’m going to play tennis today. ¿Tú vas a jugar al golf esta tarde? 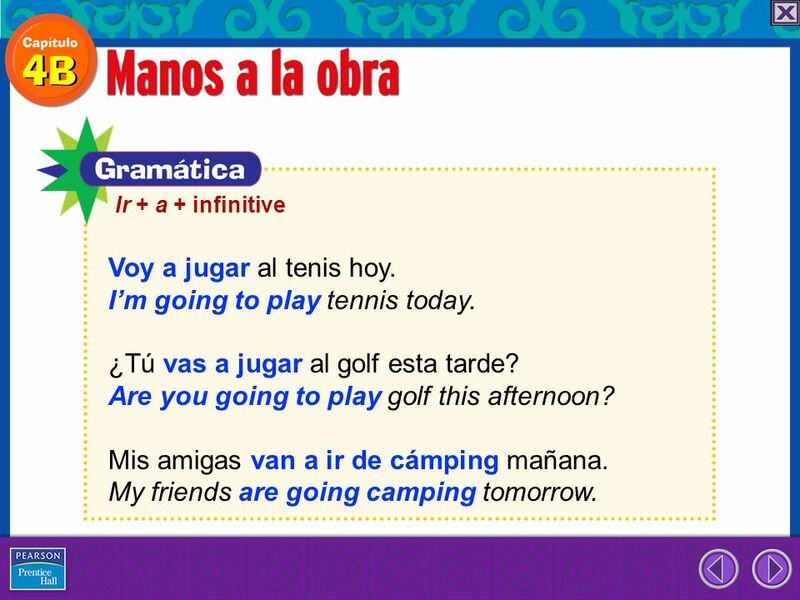 Ir + a + infinitive Voy a jugar al tenis hoy. I’m going to play tennis today. ¿Tú vas a jugar al golf esta tarde? Are you going to play golf this afternoon? Mis amigas van a ir de cámping mañana. My friends are going camping tomorrow. 4 Why do we need to know this? Ir + a + infinitive So what’s the big idea? Why do we need to know this? It’s simple…. 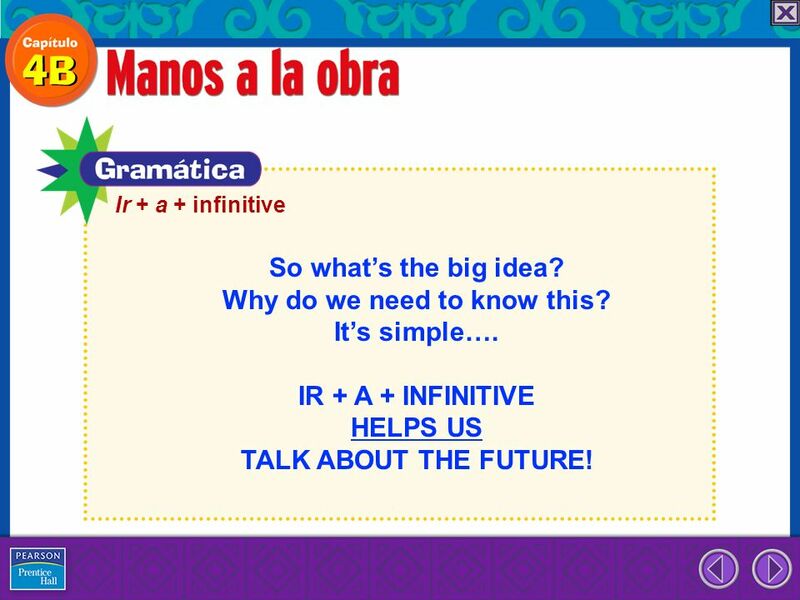 IR + A + INFINITIVE HELPS US TALK ABOUT THE FUTURE! 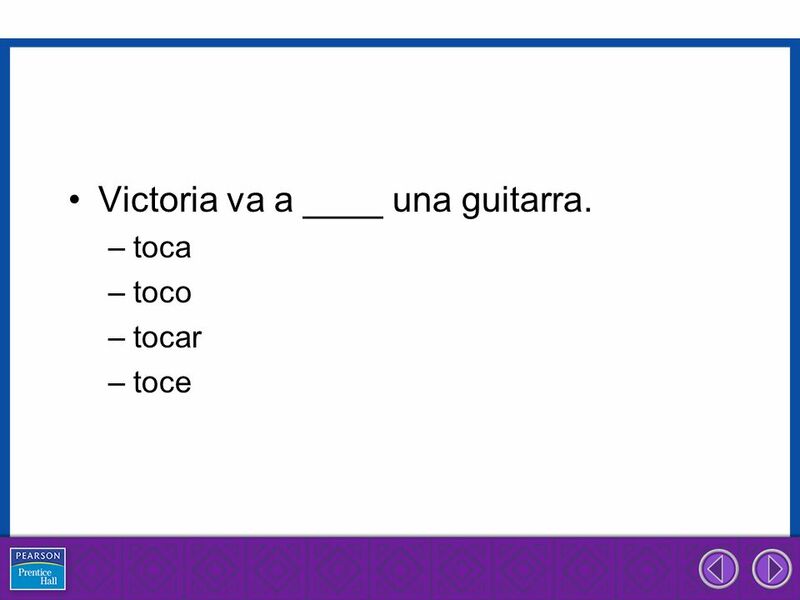 6 Victoria va a ____ una guitarra. 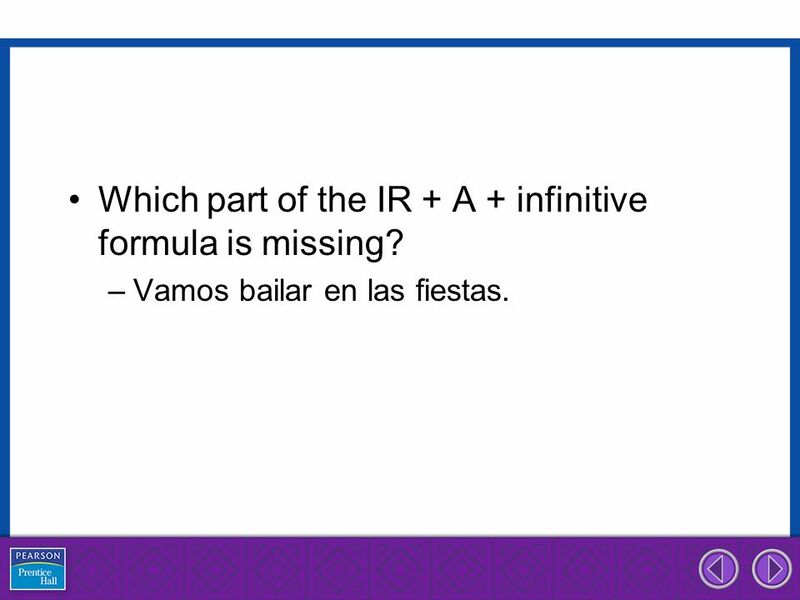 7 Which part of the IR + A + infinitive formula is missing? Vamos bailar en las fiestas. 8 Which part of the IR + A + infinitive formula is missing? Tengo que a bailar en las fiestas. 10 Say the following things. We are going to do homework. They are going to study. I am going to practice Spanish. 11 Say the following things. They are going to read. We are going to do the homework. I am going to listen to the teacher. Download ppt "Javier: ¿Vas a correr conmigo, o no? Ana: Sí, voy a correr contigo." 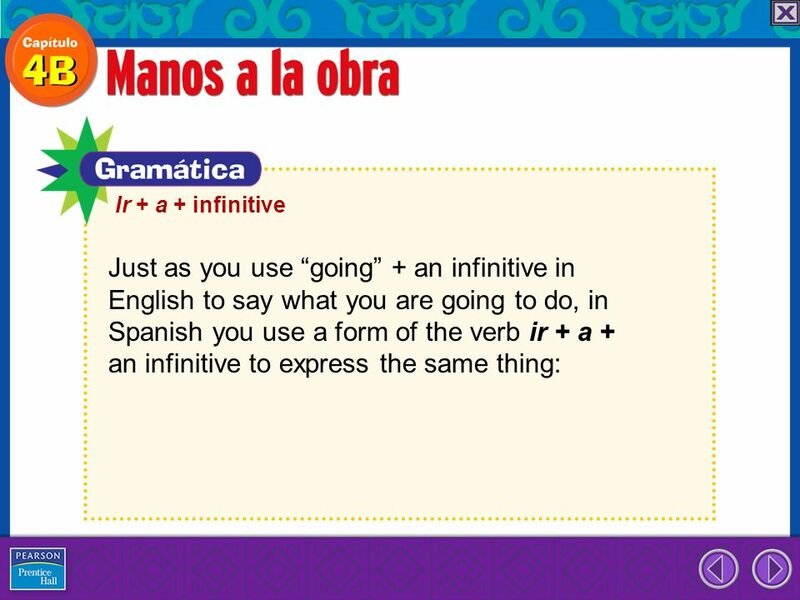 The Verb IR + A + Infinitive REGULAR VERBS Verbs whose INFINITIVES end in -ar follow a pattern. 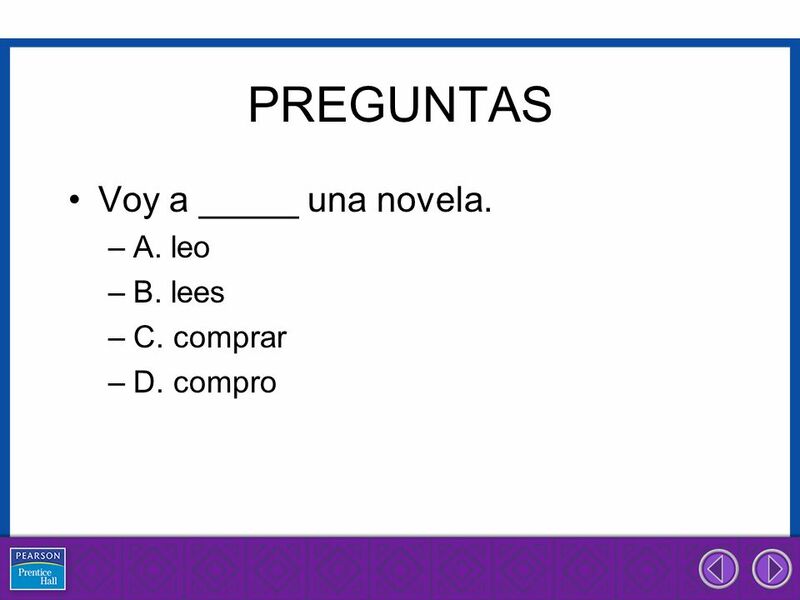 Ir with Infinitives Spanish 1- Chapter 4. Chapter 4 Final Exam Review. Can you ask someone what he or she has? (p. 121) How would you ask a classmate if he/she has some folders? –¿Tienes carpetas?